Jared Unzipped: The Impossible Fish. For years, Victor Humboldt had enjoyed eating sardines. One of his favorite late night snacks was to peel open a can of sardines and spread them across a piece of mayonnaise-covered toast. He'd finish it off with a tiny sprinkling of salt and pepper. Over the course of his long and fruitful life, Victor must have eaten thousands of cans of sardines. Considering he owned the massive Humboldt Foods Conglomerate, with offices operating in eight countries, this should come as no surprise. "Eat what you love and love what you eat," as Mr. Humboldt would say. The nipping chill of October had rolled around once again. On this Autumn evening, Victor found himself preparing for bed. A blustery storm battered the shutters outside his bedroom. Any common man with less fortitude would have believed a poltergeist were attempting to violate the property. Not Victor, though; he was made of sterner stuff. Carefully tucking the flaps of his robe into their proper positions, he kicked his velvet slippers off and pulled the heavy down blankets over him. Before long, Victor was sound asleep. To Hell with the storm and its clamorous nonsense! A strong urge to rub a tickling sensation in his left hand brought Victor to life. He rolled over to look at the large clock hanging above his wardrobe. The hour hand rested directly upon the three. He'd been asleep for approximately five hours. Uncharacteristically, his pillow was soaked with sweat, as if he'd endured a tempestuous nightmare. Lurching forwards from the warmth of his linens, Victor pushed his feet back into their slippers and made for the kitchen. At first, every joint in his body creaked and popped as he began to move. He was a little stiff, but considering he was eighty-seven years old, Victor couldn't complain. In fact, he was quite healthy for a man his age. A lifetime of eating plenty of fish, vegetables and jogging three times a week had a positive effect on his later years. Lowering himself down a spiral staircase to the ground level, the boards beneath Victor's feet squeaked much like his own joints. The pop of every step reverberated throughout his Norwegian-style manor. Paintings of long-dead sailors and saints adorned numerous walls throughout; their spectral eyes seemed to flicker back and forth with each footfall. Gripping the banister carefully, he finally made it all the way down. At the bottom of the staircase was a hallway. The corridor was lined with more paintings representing sea life and various historical nautical events. Before striding down the hallway, Victor flipped an electrical switch on the wall. The sudden burst of artificial light, which was very bright, seemed to breathe vitality into everything it touched. The dreary pieces of art immediately became more hospitable and warm to the senses. As he walked to the kitchen, the various canvas-bound subjects watched ever vigilantly. They stood guard with a purpose. The kitchen was a grand masterpiece of both beauty and simplicity. More so than any other room in the mansion, this was the place that Victor enjoyed the most. The counter tops were hand cut from black walnut wood. Their sheen created an illusion that the counters were deep black pools of obsidian water. Victor opened the antique refrigerator -- a General Electric model from the 1940's that belonged to his mother. When he'd made his first million dollars, Victor had it fully restored and returned to its original condition. You could easily describe the master of the manor as sentimental, if nothing else. From the icebox he retrieved his condiment of choice and a pitcher of orange juice. Walking into his pantry, he grabbed a can of Humboldt's Fresh Sardines. Every time he started to open a canister of the tiny fish, his sense of pride grew slightly. Sure, the sardines weren't a terribly profitable portion of his corporation, but it was something he took great satisfaction in. 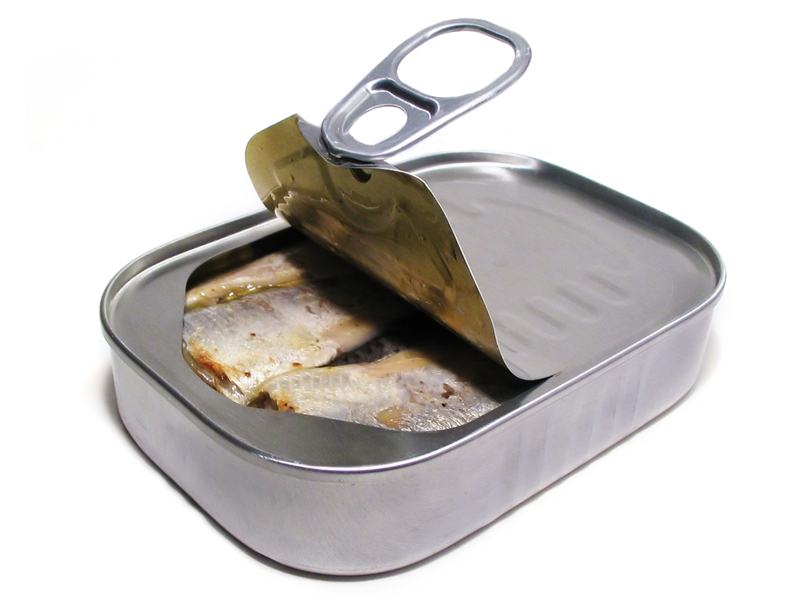 When his company was still young, sardines were a more commonly eaten food. At the time, they were economical, easy to store and kept for long periods without spoiling. Nowadays, people had moved away from eating sardines. Perhaps their taste wasn't fashionable anymore, or maybe folks thought they looked unsettling. Either way, sardine sales had been in steady decline for many decades. Yet, Victor simply wouldn't cease production. As long as he was alive, his Sardines would stay on grocery shelves. They were his lifeblood. Spreading a substantial layer of mayonnaise across a piece of toasted Italian bread, Victor could almost do this routine with his eyes closed. He stuck his fork into the opened sardine can and stabbed one of the fish. Placing it on the dressed toast, he noticed that this one still had its head attached. This was atypical; his sardines had their heads and tails removed before being packed into cans. Drawing close to the sardine, he looked at the miniature fish face. Prudently plopped onto a white beach of creamy fluff, the sardine's mouth began to open and shut with an inquisitive gape. Mr. Humboldt couldn't believe what his eyes were seeing -- a real, live sardine writhing on his toast! Quickly checking the remaining sardines in the can, he took a head count. Thankfully, they were all headless. Somehow, this lone survivor had managed to sustain itself through the packing process. With great urgency, he retrieved an empty glass bowl and filled it with water. Carefully wiping the mayonnaise off the impossible fish with his fingers, he slid it into the dish. The sardine flipped and twirled with delight in the liquid; being freed from his aluminum cage had a profound effect on its disposition. Spearing the remaining lifeless sardines and tucking them onto his bread, Victor couldn't help but watch as the vibrant and wholly puzzling creature swam happily in the pitcher. He munched on his midnight morsels with a strong sense of bewilderment. Never taking his eyes off his spirited new friend, Mr. Humboldt was entranced by the silver scales. He drifted back and forth with the swirling mercurial oddity. As the fish continued to swim, Victor floated away from consciousness and towards a dream on a distant shore. He could feel the aberrant tingle in his left hand once again, and then... a rush of cool water as he dove face first into the greatest wave. And there, swimming at his side, was the diminutive sardine. The next morning, Victor Humboldt's lifeless body was discovered slumped over his kitchen table. No signs of foul play were found. Before Victor sat only an empty plate, a butter knife, a fork, a half-used jar of mayo, a nearly-empty glass of orange juice and a vacant sardine can. There wasn't anything of malice to be said about the scene -- a kind and reasonable man died a peaceful death. Who could ask for anything more?